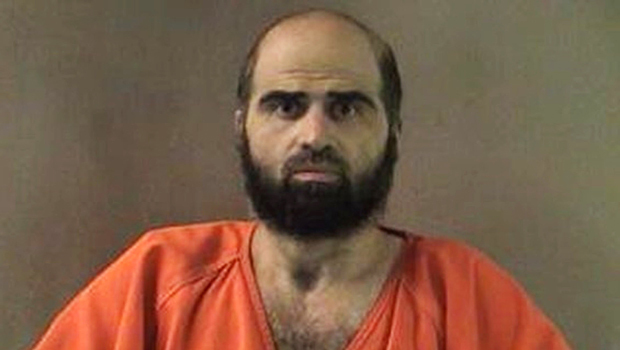 The shooting at Fort Hood in Killeen, Texas, on Tuesday was on the same base where Army Maj. Nidal Hasan opened fire in a deadly rampage more than four years ago, killing 13 unarmed people. Hasan, a former Army psychiatrist who said he was driven by a hatred of the wars in Iraq and Afghanistan, was convicted and sentenced to death in August 2013 for the attack, in which he also wounded more than 30. He is being held at Fort Leavenworth in Kansas. A Virginia-born Muslim, Hasan, 43, was shot in the back by one of the officers who responded to the shooting on November 5, 2009. He is paralyzed from the waist down and is in a wheelchair. At his court-martial, Hasan, who was not charged with terrorism, refused to put up a defense for the shooting at Fort Hood's Soldier Readiness Center. Hasan, who was to be deployed to Afghanistan, admitted that he was the shooter and made comments that suggested he wanted to become a martyr. Witnesses testified of hearing someone scream "Allahu akbar!" - Arabic for "God is great!" - and of seeing a man in Army camouflage open fire. Investigators recovered 146 shell casings inside the medical building and dozens more outside, where Hasan shot at the backs of soldiers fleeing toward the parking lot. Soon after the attack, it was revealed that members of two FBI anti-terrorism task forces saw emails between the Army psychiatrist and an al Qaeda leader, Anwar al-Awlaki, beginning in December 2008. In the emails Hasan expressed his support for suicide bombings and killing civilians; al-Awlaki, in return, encouraged Hasan to stay in touch. The task forces reviewed the communications and decided they were in keeping with Hasan's research at the time about the effects of combat in Iraq and Afghanistan. As a result, no formal investigation of Hasan was opened. Al-Awlaki, whom U.S. officials implicated in other terror plots, was later killed in a drone strike in Yemen. Hasan was back in the news in September after he was forcibly shaved at Fort Leavenworth. He had begun growing his beard in the years after the shooting, but it violated Army regulations. An employee at a defense contractor killed 12 people after he used his pass to get into the Washington Navy Yard and sprayed bullets in the hallways and fired from a balcony on workers in an atrium below. The gunman, Aaron Alexis, a 34-year-old former Navy reservist, died after a running battle with police. A Marine shot two of his colleagues to death and then killed himself inside the barracks at the Marine Corps base in Quantico. Sgt. Eusebio Lopez was a tactics instructor at a school that tests Marines who want to become officers. A schizophrenic ex-Marine was convicted of shooting at the Pentagon and other military targets. Yonathan Melaku of Alexandria pleaded guilty last year to a series of shootings in 2010, including at the Marine Corps museum in Quantico and military recruiting stations. No one was injured. He was sentenced to 25 years in prison. Abdulhakim Mujahid Muhammad opened fire on a military recruiting center killing one Army private, and wounding another. Muhammad, angry about the wars in Iraq and Afghanistan, was sentenced to life in prison without parole after pleading guilty. Army Sgt. William J. Kreutzer, who had a history of psychiatric problems, killed one soldier and wounded 18 others, one of a number of shootings at Fort Bragg. He was sentenced to death in 1996, but the sentence was later changed to life in prison.